K P, Taylor, Peter and I decided to spend one more night together. Outside of Mazatlan, somewhere in the wild of Mexico. Our destination for this trip should have been a lake in Las Iguanas, about 70 km away from Mazatlan. 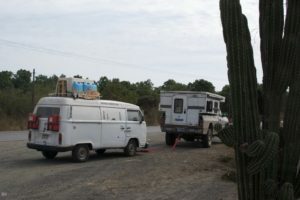 After that trip our ways SHOULD have parted on the 29.01.2017…Peter and I wanted to continue our adventure vanlife on the Baja California, K P and Taylor wanted to go further south to Guadalajara. 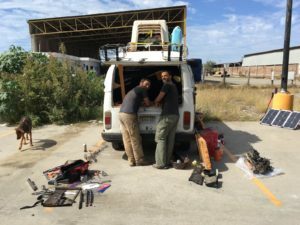 All stuff was packed and in the beginning of our trip the Rusty Old Van seemed to do a pretty good job. Until, suddenly, on a big hill a huge cloud of smoke came out of it. The following happened: The fan is, for whatever reason, connected to the lights. We didn’t turn them on because it was still daylight. So the Rusty Old Van overheated again! It’s not that it warned us about getting overheated, no it just spit smoke and stopped driving immediately! And all because of that little switch we didn’t turn on. We were so lucky that we had our amazing friends K P and Taylor with us. After a few minutes of cursing the freaking Rusty Old Van K P towed us to our planned camp spot. The lake in Las Iguanas. It was such a beautiful spot for just relaxing, fishing, sitting around the campfire and listening to the sounds of the Mexican wild. After a few considerations we decided against a Mexican mechanic. I mean we have our superheroes K P and Peter with us. Also they know pretty much the same as a Mexican mechanic. 🙂 Our spot for the night and the next day was an autozone parking lot. How beautiful vanlife is. A life full of challenges and adventures! See you on the open road one day! 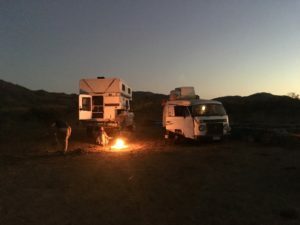 The adventure begins- traveling and living in a van	Vanlife – It’s on!! !